Welcome and thank you for visiting Shop4-heating.co.uk, part of the growing portfolio of web-based shopping channels owned by one of the UKs largest online electrical suppliers - Shop4 All Electrical Ltd.
Shop4-heating.co.uk offers for sale a comprehensive range of electric space heating products from market leading suppliers such as Consort Claudgen, Creda, Dimplex, Electrorad, Elnur, Eterna, Farho, Haverland, Heatmat, Hyco, Nobo, Rointe, Stiebel Eltron and Vent-Axia. Shop4 All Electrical's heavily discounted prices are available to all - installers, commercial, industrial and residential customers. 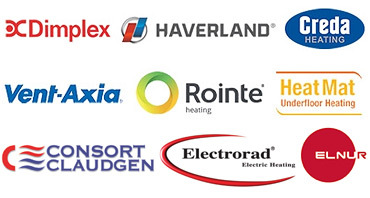 The lowest prices coupled with highest levels of customer service ensure Shop4-heating.co.uk is the obvious choice for all your electric space heating requirements.